And this is what happens when you take people from outside of tech, in this case Michael Pachter, an analyst at Wedbush Securities (based in LA), and collide them with topics that they don’t understand, in this case, Mark Zuckerberg’s wardrobe. Yeah, really. You already know this is going to end poorly. In an interview with Bloomberg (and those yahoos let anyone on), Pachter said some rather funny things. We’re going to break down his humorous statements, show their lunacy, and along the way comment on how Pachter doesn’t make sense, as he is long on Facebook, but short on the guy that, well, is Facebook. To wit, here’s the clip. For some reason it won’t embed, so jump over to Bloomberg for a watch if you don’t trust our transcription (partially via Bloomberg incidentally). We swear we did our best job, but it’s almost quitting time, so a mistake might have landed in the mix. Host: [Pachter] was the very first to issue a buy recommendation on Facebook’s stock, with a target price of 44 dollars a share. He joins me now, from LA. Michael, obviously you’re very optimistic about Facebook’s potential here, but one of the things that you think is a big risk to Facebook, is actually Mark Zuckerberg himself, and his mission to connect the world. How do you see that as a risk? Pachter: You know I, I think [that] you actually said something earlier, that was pretty important: Mark and his signature hoodie: He’s actually showing investors he doesn’t care that much; he’s going to be him, and he’s going to do what he’s always done. Break! We can’t let the man go any further yet, because there is enough here to paint every ceiling in the Vatican. First up: Mark and his signature hoodie. I don’t think that he wakes up, and says to himself ‘well, better look like Mark today, guess I’ll dress slovenly.’ No, I think he simply likes to wear the darn things, and that’s about it. If I was Zuck I wouldn’t wear a shirt at all, as I despise the things, but it wouldn’t be something that I self-ascribe as ‘signature.’ Anyway. Now to the next point: that Zuck is flipping the bird to investors, by dressing like himself. 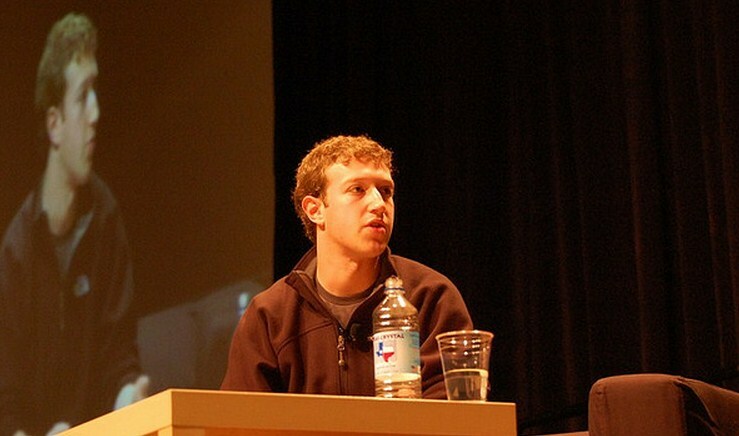 Ask yourself this: if Zuckerberg started wearing a suit, what would it mean? Nothing, really, but it could be misconstrued as the company ‘growing up,’ which could scare employees who currently like the way that it runs. And, since Facebook is doing quite well, in case you hadn’t heard, that’s pretty important. But even better here is the implication that wearing anything less formal than a suit is an insult to investors. Oh, boo. Investment banks fought to get Facebook’s IPO business, and a flag of the company is flying on Wall Street. The only person showing disrespect here is Pachter, because he apparently has no idea what he is talking about. And finally: “he’s going to be him, and he’s going to do what he’s always done.” That’s to say that he’s going to build a $100 billion business and change the world? That’s what the hoodie signifies? Well then, I think that he shouldn’t take it off at all costs! To hear this guy talk, you almost wonder if he thinks that Facebook is set for a rough road show and a difficult offering. Except that he’s not, as he’s come out as the first guy calling for a buy rec on the stock. So he expects it to go very well. And he expects that Mark is currently torpedoing the entire thing due to his decision to wear something that allows for normal breathing (how do people work in ties?). Perfectly logical. Also, ‘respect they deserve.’ What the hell does that mean? Not sure I’m off base, but if a visionary multi-billionaire walked into my house buck naked and asked for a twenty-spot, I’d hit up the ATM if I had to. But that’s not really the point, right? He thinks that Mark not wearing a tie (Zuck could buy every tie company in the world, probably, if he wanted to), and instead wearing a hoodie, means that savvy investors are going to look at his massive company differently. Except not. Well, except, except for Pachter. But he’s bullish on Facebook, right? This makes no sense. Pachter: So, what I’m concerened about is that he is trying to connect the entire world, and he’s not going to let minor considerations like revenues, not let that get in the way. And I think that the share price implies really rapid revenue growth, [and] I’m not sure that we are going to see that in the next couple of years. Again, Pachter manages to get mad about Facebook’s goal that has so far made the company all its money. Here’s how: Facebook, by connecting oodles of people and learning about them has built the most highly targetable ad platform, ever. And by ‘trying to connect the entire world,’ Facebook can sell huge numbers of those targeted ads, as the company has massive inventory. So, the company’s vision leads to its revenues, while Pachter claims the opposite. Well done! Next up: ‘minor considerations like revenue.’ This is lunacy. Facebook, under Zuck’s hoodie-regime-of-terror has made billions and billions in revenues. And finally, Pachter really confuses himself: after implying that the IPO price is too low (as he expects the firm’s share price to rise), he says that the fundamental assumptions built into its pricing are wrong, and therefore intimates that the IPO is overpriced. But remember, he’s long on the stock. Both sides of the issue? He’s on them! Host: In some way Michael, could Mark Zuckerberg be Facebook’s biggest asset, as well as its biggest risk? Pachter: He most certainly is a genius, and he really has done something that no one else could do. Yeah, and he did it wearing a farking hoodie.